Home > Fun > silly. A Dutch town has officially opened a ‘silly walks’ road crossing, in honor of a classic sketch from the 1970s BBC comedy, Monty Python’s Flying Circus. Spijkenisse near Rotterdam has replaced the usual crossing sign by the town hall with one of a man with a bowler hat and briefcase flinging his leg high in the air, in emulation of John Cleese’s performance from the ‘Ministry of Silly Walks’ sketch. Alderman Jan Willem Mijnans liked the idea, and agreed to preside at the not-very-formal opening of the rebranded crossing. “It’s nice to see people crossing the street with a smile on their face, and we hope lots of people will do so,” he told the expectant crowds, before trying out his own silly walk. The crossing is one of the busiest in town, but Mr Mijnans assured the public that, no matter how silly their progress, “traffic rules still apply, and cars have to stop as normal”.He added that the sign will revert to the original if it proves to be more of a distraction than an aid to road safety. 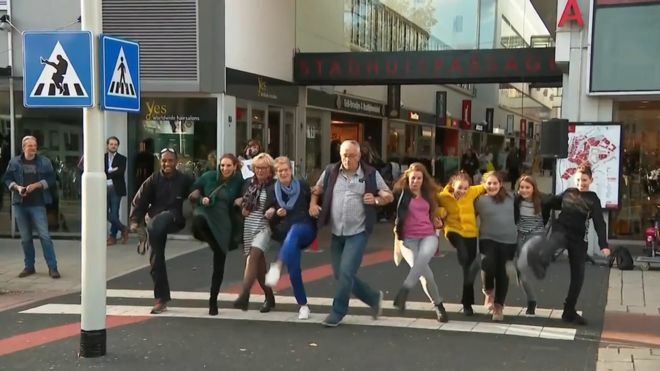 The people of Spijkenisse have taken to the idea with great enthusiasm, and filled social media with clips of pedestrians crossing with a variety of outlandish gaits. ‘mix a little foolishness with your serious plans.